It is safe to assume that all plant engineers are aware of the extreme financial penalties and, more importantly, the potential dangers associated with heat exchanger tube failures. These failures and related emergency shutdowns presently cost the industry millions of dollars per day and billions of dollars per year on a worldwide basis. 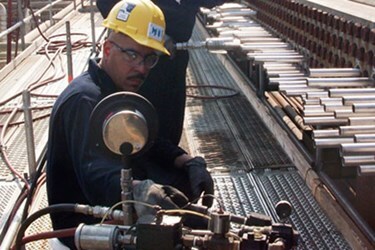 In 1985, CTI Industries in Orange, Conn., developed a technology that extends the service life of new or eroded/corroded heat exchanger tubes — the Full Length Tube Liner™. CTI Full Length Tube Liners™ are thin-walled tubes that are hydraulically expanded into the existing heat exchanger tubes. They are constructed from a number of different erosion/corrosion resistant alloys. This allows the metallurgist to select a material that will resolve the specific problem of the exchanger tubes in question.